Ever make one too many chicken fingers or fish fillets? Odds are that every week you have leftovers that you scratch your head on how to use them. Well, look no more! This week, I made one too many chicken fingers for the girls for dinner and I put the chicken fingers in the fridge in hopes of using them again. The only problem is that I only had a few left and if one Princess has something, the other one MUST have it. 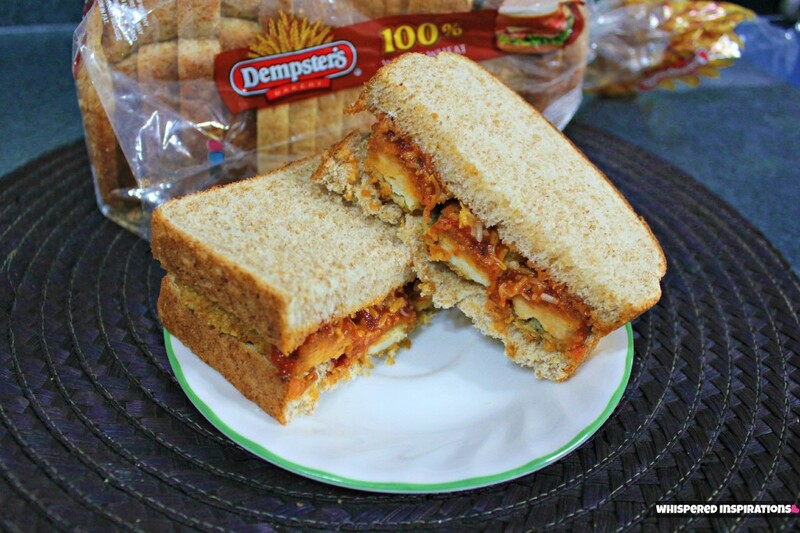 So, to avoid that dilemma–I decided to give those chicken fingers a little lovin’ by putting them in between two slices of 100% Whole Wheat Dempster’s Bread. 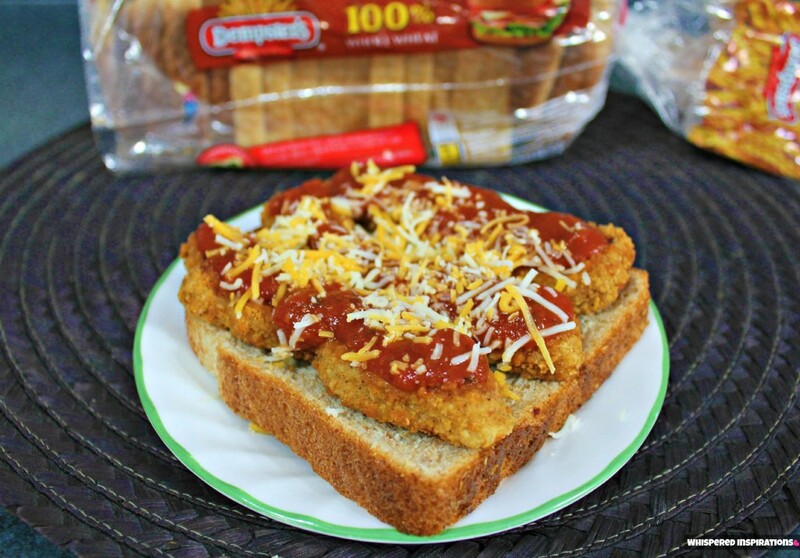 I decided to make a Breaded Chicken Marinara Sandwich that was smothered in delicious marinara and Colby Jack cheese, it was a super quick and easy! It literally took me 5 minutes to make and I got praised for my creativity. Pick Your Favorite Dempster’s Bread! First thing is first, you have to choose your favorite type of Dempster’s bread. Whether it’s 100% Whole Wheat Bread or White Bread, it’s entirely up to you. If you want to see more delicious leftover recipes, you can try the Chicken Fiesta Sandwich, Meatball Marinara Sandwich and the Fish-Wich. But, if you’re a sucker for breaded chicken, you’re gonna love this delicious sandwich! Get your chicken fingers out of the fridge and lay them on top of one slice of Dempster’s, don’t reheat them just prepare it cold. Add your favorite marinara sauce and apply generously onto the chicken fingers. 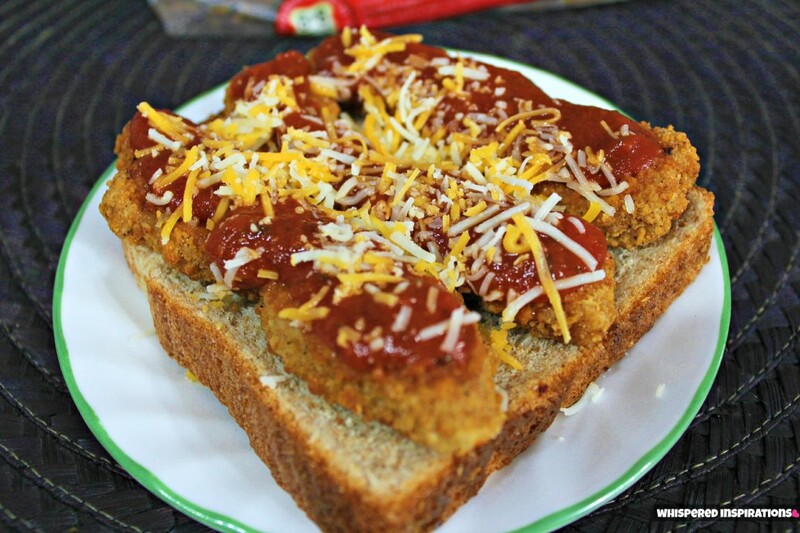 Make sure that when you top it with marinara that you generously top it on top of the fingers only, they can absorb the sauce well and it makes for a less messy sandwich. If you apply it carefully, you won’t have a mess at all. This sandwich came out perfect if I say so myself. Now, get out your favorite cheese and top the chicken marinara to taste. I opted for Colby Jack since this is Hubby’s favorite cheese but, swiss or mozzarella would work great too! You can pair it with a side of pickles or a fresh salad of your choice and make it a nice hearty lunch! Now, it’s your turn to create masterpieces and re-invent the sandwich with yesterday’s leftovers into your new favorite sandwiches! 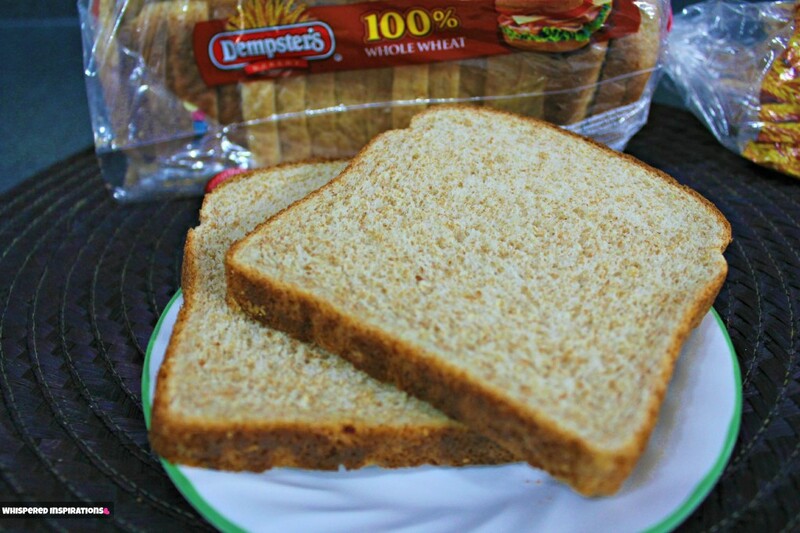 Dempster’s is giving one lucky Whispered Inspirations reader 10 free product coupons for any bread product from Dempster’s! This is the perfect chance to stock up your shelves with Dempster’s or their sister products as well. For more information, you can visit Dempster’s, here. If you had to make a sandwich using just leftovers, what would you make? Sandwiched made of leftovers are great! I posted about my fish sandwich….now I just want to make too much fish again so I can have sandwiches for leftovers LOL! Maybe a meatball sandwich with melted cheese! YUMMY! Whenever I make a sandwich with leftovers its a hot chicken or a hot turkey sandwich. One can never have too many recipes for using up the left overs! Thanks for sharing!! My recent post &quot;S&quot; at 24 months: Bring on the Tremendous Twos! Oh, I think i would make the same thing as you. Just add some parmesan and you have a chicken parm. sandwhich! I love a turkey and dressing sandwich after the holidays, with lots of mayo! That looks absolutely delish Nancy. How creative of you! I wonder if my kids would enjoy that sandwich…maybe I'll give it a try on Monday when they are home because of the strike. Spaghetti sandwiches are a hit in our house! I love making sandwiches with left over chicken fingers! We did that earlier this week as well, but I never thought of adding the marina sauce, must try it with that soon! I would make a turrkey and stuffing sandwich! I would make a BBQ chicken sandwich. I'd love to try the Meatball Marinara. Chicken salad sandwiches made from leftover rotisserie chicken, mmmmm so good! 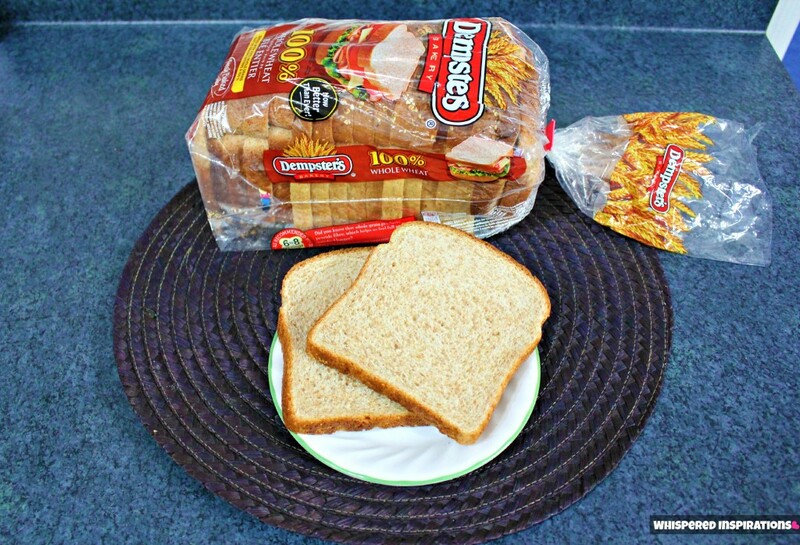 I love to make a Tuna sandwich with Dempster Bread. With Mayo and spices. Also lettuce and shredded Mozzarillo cheese. I am awaiting a killer leftover turkey sandwich. Open face with gravy or straight up with mayo and cranberry sauce. Both are are just as good as first time around turkey dinner! Leftover roastbeef slices, dijon and pickles. Left over Chili with cheese sandwiches ! I would use leftover ham to make mini-ham and cheese melts. I would make a chicken salad sandwich. I would make Sloppy Joe pita pocket with my leftovers. I would also use leftover chicken, it seems a favourite. Oh, jeeeez! Nancy, this post has me wanting some of that Chicken Marinara! We use leftovers for sandwiches the next day too. Love chicken salad sandwiches or roast beef sandwiches. Yum. I like making chicken sandwiches using leftovers. I would use leftover chicken along with some spicy mayo to make a sandwich. I love using Pesto. Even sundried tomatoe pesto and cheese on turkey. I would use leftover steak or roast beef to make a philly. Would pick leftover Mac n Cheese with more cheese! I would make a leftover turkey BLT sandwich. I've made these before! We call it a nugget sandwich, since we make them with leftover chicken nuggets. Whenever I have left over turkey I make club house sandwiches. Left over stuffing, chicken/turkey and gravey – mix the meat into the stuffing, heat, slap it on some bread and top with gravy – yum! Roast beef with black olives, dill pickles, banana peppers, mozzerella and ranch dressing. meatball sandwiches, turkey sandwiches mmmm ham sandwiches…. tuna sandwich with Dempsters bread, with a little bit of red onions! Hot turkey sandwiches with leftovers from turkey dinner. Yum! I would use the leftover beef stirfry. My recent post Penguin Books delivers! I love a good meatloaf sandwich. Just add dempsters bread, a little mayo and some cheese and meatloaf. Maybe lettuce and tomato if I feel the need for veggies. I would make a Roast Beef Sandwich. The Barbeque Chicken Sandwich would be a great way to use chicken leftovers. I'd make cold crockpot roast beef, horseradish, mayo, mustard and jarlsberg cheese on a Dempster's bun. You can also make it a grilled sandwich by adding the mayo after grilling it-you could also add a small amount of zesty italian dressing for some zing.